Winter Blues and your Pet. What to Do ? In the coldest seasons, your pet trembles as soon as he sticks his nose outside. The salt spread outside to melt the ice attacks his skin and paw pads. And his bowl of water becomes a block of ice. Solutions ? As soon as your pet sets foot outside, he trembles. Why ? Is he nervous, excited or cold ? If he trembles with cold, he’s not playing a role to get your attention. Remember that the ambient temperature on the ground and 1 meter from the ground can vary by a few degrees. Your pet could be cold for many reasons – he is getting older (since, with age, like humans, animals get cold more easily); his fur is inadequate for very cold weather (an indoor pet has thinner fur); he has a particular metabolism (a disease can affect the body’s thermoregulating centre). And there are many more. * Don’t wait for warmer temperatures before going outside. 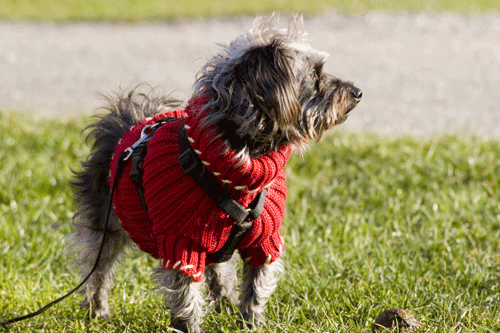 * Buy your pet an adapted coat or make one yourself out of a blanket, a sweater, or a warm fabric (wool, polar, etc). * Before going out, slip your pet into his coat, a routine he will appreciate. * If he trembles, act fast. Take him in your arms, go back inside or provide him with an adequate shelter. Outside, you spread salt and calcium around the house and every municipality uses a phenomenal amount on the sidewalks. The irritating and corrosive salt attacks everything – metal, leather, cement… Imagine your pet’s paws and pads ! During your daily outings, the salt accumulates in your pet’s fur, irritates his skin and provokes cracks in his paw pads. When he gets back to the house, he licks his paws for long periods of time to remove this irritant and he also swallows salt. * Soak each paw in a container of warm water. * Dry them with a towel. 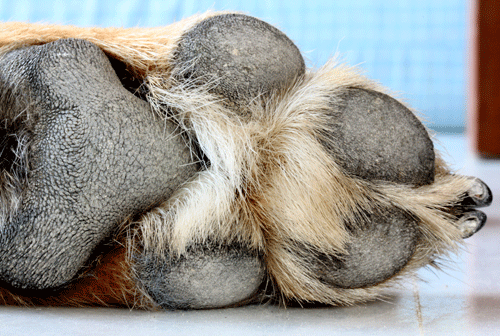 * If necessary, apply to the paw pads a moisturizer containing lanoline, or shea butter, without perfume. * Thinking of buying your pet some boots ? If so, do a test first, since animals often refuse to wear them ! Your pet eats snow outside, but prefers to drink fresh water. Except that after a few hours, his bowl becomes a block of ice. Always have two water containers. Put a bowl out in the morning filled with warm water and another in the evening. The warm water will take more time to freeze. Wishing everyone a happy winter !